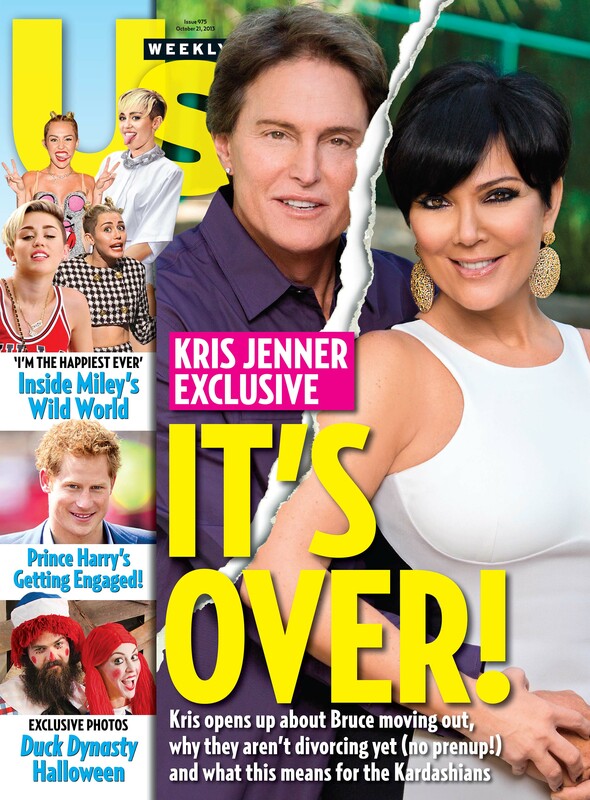 Kris and Bruce Jenner are through. This is according to an interview with Kris Jenner in the newest issue of Us Weekly magazine. She noted in the interview that the couple had split a year ago and that “we are living apart. But there is no animosity. We are united and committed to our family.” She added that while the couple has split, there are no plans at this time for an official divorce and that they remain on good terms. “We ended a marriage, but that’s not the end of our friendship,” she told Us. “I will always love him, but we are longer a couple in that way.” The couple had two children together, seventeen-year old Kendall and sixteen year-old Kylie. Kris is also mother to the famed Kardashian children, Khloe, Kim, Rob, and Kourtney, whom she had with her previous husband Robert Kardashian. He died in 2003 and had four children from previous relationships including sons Brody and Brandon. Both are in their thirties now. More on this story is available online at http://www.usmagazine.com/celebrity-news/news/kris-jenner-bruce-jenner-separate-after-22-years-of-marriage-i-will-always-love-him-2013810#ixzz2hAmn1Um0. More information on this and other stories from Us Weekly is available online at http://www.facebook.com/UsWeekly and http://www.UsMagazine.com. To keep up with the latest sports and entertainment news and reviews, go online to http://www.facebook.com/philspicks and “Like” it. Fans can always keep up with the latest sports and entertainment news and reviews in the Phil’s Picks blog at https://philspicks.wordpress.com. The writers behind Hell on Wheels surprised a lot of people when the show debuted two seasons ago on AMC. But two seasons in (and a third season preparing to premiere this Saturday night), it has more than proven itself, as have its writers. The show’s second season is now available on DVD and Blu-ray. And with Season Two’s home release, Hell on Wheels’ writers have proven yet again why it does in fact live up to the hype of being one of the best dramas on television today. The show’s writers have taken what they started with in its debut season and stepped it up in big fashion in Season Two. Audiences find out what became of Cullen Bohannon after he left Hell on Wheels at the end of Season One. They also see everything that has transpired in the town, too. The brothers Mcginnes have gone from being two young naïve Irish immigrants to being relatively successful businessmen with their own personal drama. The relationship between Joseph Black Moon and his “father”, Reverend Nathaniel Cole has become very strained, to say the least. And the on again/off again romance between Elam Ferguson and his love interest Eva has reached quite the interesting point, even though Eva is married to another man. Let us also not forget Thor Gundersen (A.K.A. The Swede). He reaches perhaps the lowest point possible in the show’s climactic final episodes that are sure to have major implications in Season Three. One would assume just by seeing everything here, that there was an awful lot going on in Season Two. That would be right. It would be just as easy to assume that with so many storylines going on, they would end up stepping all over one another. That assumption is wrong. Somehow, the show’s writers were able to take each one of the storylines in Season Two, and keep them entirely separate of one another. At the same time, they also managed to keep each story line tied into the other smoothly. The connections were so smooth that audiences that have yet to see Season Two will have no trouble following them or how they tie into one another. This solid writing is the crux of the continued success of Hell on Wheels. There is much more that continued to make it successful in its second season, though. Audiences will also find that the acting on the part of the main cast does its own part in making the show believable. The writers behind Hell on Wheels Season Two took the success of the show’s first season and amped things up this time out, developing each storyline clearly and at a pace that doesn’t leave viewers scratching their heads. This is a major positive to Season Two. It’s not the only positive. Just as the writing was executed so well, so was the ability of the cast to interpret the scripts. The cast’s acting was just as believable this season as it was in its debut season. This is something rare in television’s current era. Far too often, viewers know that they are watching a show on the screen. But in the case of Hell on Wheels, the cast’s chemistry and its ability to interpret each episode’s script is at such a level that it makes suspension of disbelief so easy for audiences. It’s so easy to be pulled in that audiences won’t want to stop watching from one episode to the next, even with this drama being so much less like other serials on TV today. It’s one more sign of just how impressive Hell on Wheels remains in its second season. The writing and acting in Hell on Wheels’ are integral parts of the show’s success. This is just as evident in the show’s second season as it was in its first season. They can only do so much by themselves, though. The people charged with capturing the cast on camera and setting the tone in each scene are just as much to thank for the show’s success in its second season. The cinematography is just important in the success of Hell on Wheels as the writing and acting. And suffice it to say that the cinematography was just as expert in Season Two as it was in Season One. The wide shots of the railroad being built set against the backdrop of the plains under clear blue skies were stunning. The lack of civilization served to make the colors of the plains and sky even lusher. And the exterior shots, setting the scene within the town created their own emotions. The contrast of the muddy ground against the buildings and tents does something just as special. Not only does it illustrate the colors, but it serves as a stark contrast to the scenes showing the railroad being built. The camera crews did a wonderful job capturing the set shots throughout each episode. The camera work during each episode’s shootouts and the deeper, more emotional moments were just as powerful as the rest of the camerawork throughout Season Two. It’s one more factor that along with the drama’s writing and the acting, will fully immerse viewers in the story. Together, all of these factors make Hell on Wheels Season Two more proof that cable based dramas are as good as the programming that spans the “Big Four” if not better than those shows. And whether one is new to Hell on Wheels or not, all of these factors make this another must see season. Season Two is available now on DVD and Blu-ray in stores and online. It can be ordered online via Amazon at http://www.amazon.com/gp/product/B0075FF5QM/ref=as_li_qf_sp_asin_il_tl?ie=UTF8&tag=filmsiteorg-20&linkCode=as2&camp=1789&creative=9325&creativeASIN=B0075FF5QM. And fans can get up to speed up Hell on Wheels on the show’s official website, http://www.amctv.com/shows/hell-on-wheels. Audiences can also keep up with the latest Hell on Wheels developments on the show’s official Facebook page, https://www.facebook.com/HellonWheelsAMC. “Hell on Wheels” has so much going for it. Even being a serial, it has a certain quality that makes it stand out from other serials and scripted shows in general. First and foremost, the show’s writers are to thank for that. The storylines keep audiences gripped from Cullen’s first shot to the end of the season finale. That the episodes don’t begin with the standard “previously on” makes the show that much more appealing. And of course, there are the sets, costumes, and general shooting. All combined, they come together for a great first season now on blu-ray and standard def dvd. The general shooting and planning are among the main factors that make “Hell on Wheels” the impressive show that it is. And fans will get an even deeper look into those factors thanks to the bonus features included on the set’s third disc. Those bonus features will appeal especially to students and enthusiasts of theater construction and production. The “making of” featurette shows how the people behind the cameras made “Hell on Wheels” come to life, even with a wet Spring. Perhaps one of the most intriguing moments in the “Making of” featurette comes when negotiations with the local Native American tribe are discussed. It was obvious how real the crew wanted the show to look being that they wanted to talk to the local tribe first and get their okay. Staying on the track of believability, one wouldn’t even have known that the story that was supposed to have taken place in the American midwest was actually taped in Canada. That’s a positive mark for the work done by the crew. The work done by the crew to build Hell on Wheels and bring it to life is only part of what makes the show a hit. The show’s scripting is another major bonus. Just as the production crew did its part to make the show believeable, the show’s writing adds to that believeability. As many interweaving storylines exist in each episode, the show’s writers have done an impressive job not allowing them to bog down each episode. And now, thanks to being released on blu-ray, fans can even get a synopsis on each episode before watching them thanks to an episode-by episode featurette. To sweeten the deal, the Spark Notes style featurettes are guided by the cast members themselves. That tiny detail makes the featurettes that much more worth watching. And watching them makes following the storylines that much easier to follow. So Kudos to AMC and Entertainment One for including them in the new blu-ray presentation. Whether for the storylines, the production or the cast itself, “Hell on Wheels” has so much going for it. In an age when reality tv and game shows are dominating the Big Four, this show is even more proof of how much better cable programming is than that of the Big Four. And now that it’s on blu-ray, fans who might have missed episodes during the first season can watch the show at their convenience. By the time audiences get tot he final moments of the season finale, they will be hooked, waiting with baited breath, for Season Two later this year. To keep up with all the latest entertainment reviews and news, go to http://www.facebook.com/PhilsPicks and “Like” it or its companion page at http://www.facebook.com/pages/Reel-Reviews/381028148587141. Daily updates are also available at https://philspicks.wordpress.com. 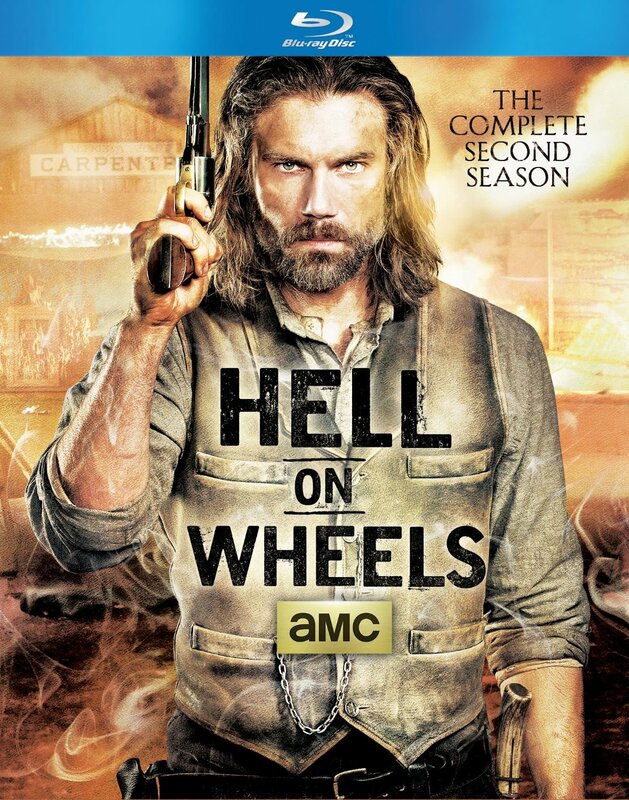 “Hell on Wheels” is a good fit for AMC. That’s because its serial status aside, it comes across more as a movie than an actual television show. That’s not an entirely bad thing, either. It’s one more piece that shows–even as violent and sexually explicit as it got at times–that Westerns are still popular, even in the twenty-first century. Season one sees Confederate Civil War veteran Cullen Bohannan joining Thomas Durant’s Union Pacific railroad as it makes its way westward across the United States. Bohannan has joined the railroad in an attempt to hunt down the men who killed his wife and his son. Things aren’t easy at all for Bohannan while he’s in the railroad town of Hell on Wheels. The whole time he’s there, he’s constantly at odds with Durant’s head of security, Thor “The Swede” Gundersen. That’s not all, either. Not only does Bohannan have to deal with Gundersen, he also has to find Lily Bell, whose husband was working with Durant to plan the Union Pacific’s route. He also has to help take down the renegade Native Americans who killed Lily’s husband and derailed a train. There’s even what seems to be a bit of a budding romance between Bohannan and Lily. One can’t help but wonder though if anything will happen, considering how Season One ended. Season One’s finale in mind, the writing behind “Hell on Wheels” makes for stories that both male and female audiences will love. There’s more than enough action amd beautiful cinematography throughout Season One to keep the attention of its male audiences. The drama of Durant and Gundersen backstabbing each other for their own devious purposes and the possibility of romance between Bohannan and Lily will pull in female audiences. There’s also the growing romance between Elam Ferguson and Eva that said audience will also grip said audiences. Of course, it should be noted that considering the mix of explicit violence and sexuality, “Hell on Wheels” is not proper for younger audiences. The violence and sexuality aside, there’s something about “Hell on Wheels” that makes it stand out from other tv shows. 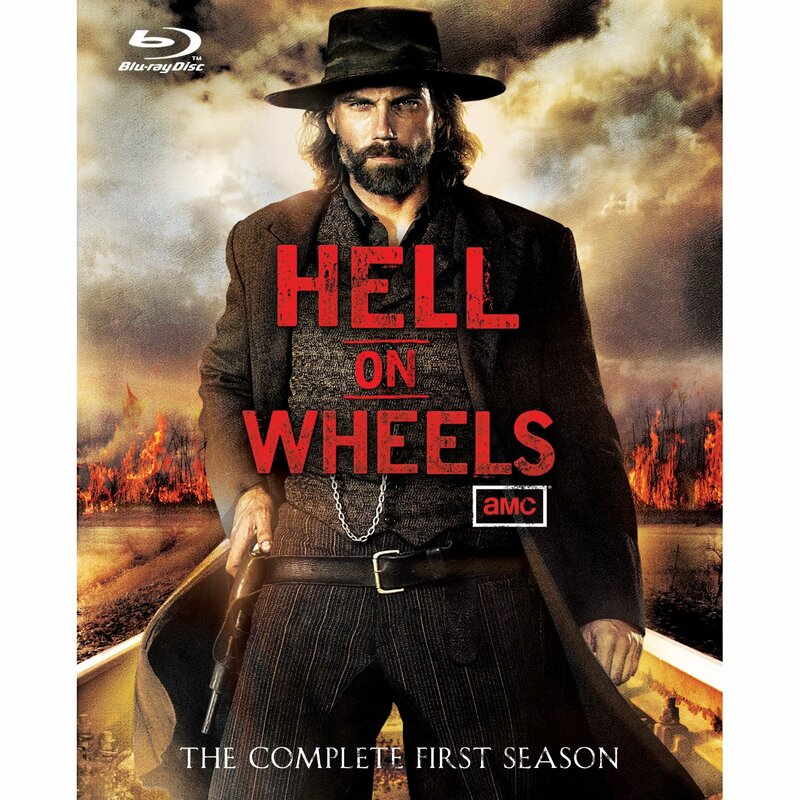 It’s been noted by one source that “Hell on Wheels” comes across more as a movie on television than a standard tv serial. That’s actually a good description. The combination of cinematography, stories and acting all combine for a serial that has its own identity. Rather than doing the standard sparknotes style “previously on” opening, each time, each new episode picks up right where the previous episode left off. That straight forward opening forces audiences to watch the previous episodes. And audiences who do watch each episode are handsomely rewarded with a show that is one of the best serials on tv today. Now with Season One on dvd and blu-ray, audiences can only hope that after such an outstanding first impression, the show will continue to hold up its reputation when it reutns later this year for its second season. To keep up with all of the latest entertainment reviews and news, hit “Like” on the Reel Reviews Facebook page and its companion page at http://www.facebook.com/pages/Reel-Reviews/381028148587141 and http://www.facebook.com/PhilsPicks.